The Goad Squad featuring Leonard Caston. 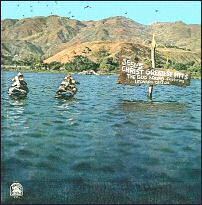 Rare Earth Records 1972. Basically a compilation of covers of songs related to Jesus. An organ driven "my sweet lord" sounds like roller rink material until the vocals kick in and the organ player cuts loose a little. Spirit in the Sky is worse than the original. The choral vocals are horrific. Once again the organ leads the charge on an orchestral "bridge over troubled waters" at least they keep it instrumental. I would say it is a little too animated to be muzak, and gets a lift near the end when the strings and organ work together, but even still why bother? A cover of "let it be" is pointless and this version is on par with the rest of the record. The roller rink organ rears it's head and makes me wonder why I am not throwing this lp across the room. They start side 2 on think ice, covering the Ramsey Lewis classic "wade in the water". Added vocals and piano instead of an organ keep it interesting. The get funky on "put your hand in the hand" but the bass and guitar get off set by the organ and JC superstar female backing chorus. "Heaven Help us All" is an instrumental track that has a couple moments, but finish listening to it and "Amazing Grace" is up next so watch out. Now if covering "Let it Be" is pointless, covering "Amazing Grace" is just stupid. But the God Squad have some tricks ups their sleeve, if you can make it past the first verse of overblown vocals, you get a double time workout for the rest of the tune(thankfully short)- a nice surprise. They close with their best groove on "oh happy day"
You're way too hard on this album.